The high-tech, two-piece system comes from the makers of the 'Mr Beer' kit. America’s obsession with craft beer has brought with it a renewed interest in homebrewing. At the same time, the craft beer scene has also elevated homebrewers expectations. In the 1970s, you might homebrew just to drink something other than a Schlitz. But nowadays, every batch you brew is likely to get compared to Pliny the Elder. As a result, a number of small appliances have come along to make homebrewing not only easier, but also more flawless. Pico is probably the best known brand: An all-in-one all-grain homebrewing system that has raised millions of dollars through Kickstarter. Now, you can welcome its newest competitor in the US market: BrewArt. BrewArt has a couple advantages over other “new” homebrew appliances. First, it’s not actually “new” at all. Though the product’s recently launched Kickstarter campaign is the first time it’s been available in the US, the system launched in Australia last year. Second, though the brand plays this down, BrewArt is actually a “spin-off” of Coopers – the largest Australian-owned brewery and one of the world’s best-known homebrew supply brands which also makes the famous “Mr Beer” kit. Needless to say, BrewArt is a bit higher-minded than Mr Beer, which may explain why its wants to keep the brands separate. Still, calling this your serious Mr Beer upgrade seems like a missed marketing opportunity. 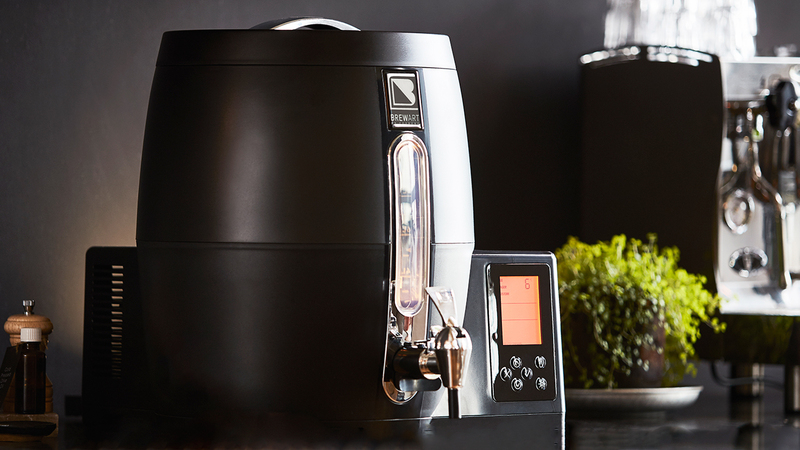 What you get with BrewArt is what you’d expect from any modern appliance looking to compete in the push-of-a-button brew-it-yourself game. The smartphone-controlled system is fully automated with users having the ability to either pick from established recipes and kits or make their own, whipping up batches about 21 pints at a time. Another thing that sets this system apart is that it’s actually two pieces: a BeerDroid that brews and a BrewFlo that dispenses. Though the two-part system clearly has its upsides, the biggest downside, beyond taking up more space, is that the pieces need to be purchased separately: retail prices of $799 for the BeerDroid and $699 for the BrewFlo. The first 30 people to pledge on Kickstarter can get both for $995, after which you’re looking at $1,295. The latest Pico retails for just $549. Frankly, I haven’t tried any homebrew appliances. When I homebrewed, I did it the old-fashioned way with pots, buckets and carboys. But if you’re interested in the these homebrewing-made-simple devices, BrewArt seems to have as good a pedigree as any of them.